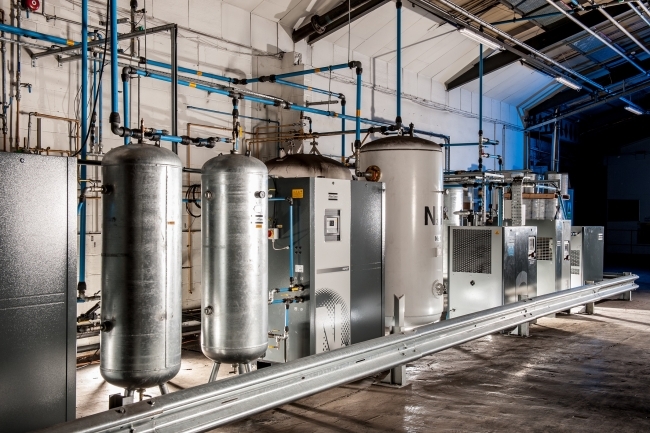 A dependable supply of nitrogen and oxygen gas is crucial to many industrial processes. Arron Farghaly from Atlas Copco looks at how many companies have now converted to on-site generation, making substantial gains in productivity and energy efficiency, saving on costs and increasing safety. Nitrogen must be in liquid form for transportation before being converted back to gas on site, but it takes a great deal of electrical energy to reach the liquefaction point of -196°C. There is also product loss during the transfer and storage process: 0.3 to 3% of volume each day. And if bottled gas is used, up to 10% of the delivered gas will be returned to the supplier. To understand the benefits of on-site generation, we need to look at specific applications. Within the food and beverage sector, for example, nitrogen is vital. Its uses range from purging kegs and tanks to product bottling, as well as modified atmospheric packaging (MAP), which extends shelf life. The primary benefit of generating gas on site is that the purity can be selected by the user. For example, in fibre laser cutting, nitrogen is often used as an assist gas delivered from high-pressure cylinder packs. These packs are ten times more expensive in terms of energy requirement than on-site production of the gas. The electronics industries also employ nitrogen, primarily as a cooling and blanketing medium. Other major users are oil, gas, chemical and petrochemical processing sites. In these applications a purity level between 95 and 99% is often sufficient. Oxygen can be generated for applications such as biogas production, or clean water treatment plants. There is also a growing market for aquaculture growth in fish farms. For all these uses, delivered liquid oxygen is often purer than necessary. The cost of delivered liquid nitrogen can range from 10p to 30p per m3, or 60p to £3 per m3 for bottles. Meanwhile, the cost of generating nitrogen on site can be as little as 2.5p per m3, and no more than 9p depending on requirements. For industrial gas users who find themselves without the capex to make the initial investment for on-site production, finance deals are becoming more readily available. On-site generation technology is continually evolving, using the principle of cycle time modulation (CTM). When demand or conditions change, an algorithm produces the nitrogen at the most efficient setting. This results in a longer cycle length, reducing air consumption in low-load conditions and maximising energy savings. There is also less wear on valves, leading to increased service intervals. If nitrogen demand drops to zero, the machine adopts standby mode. 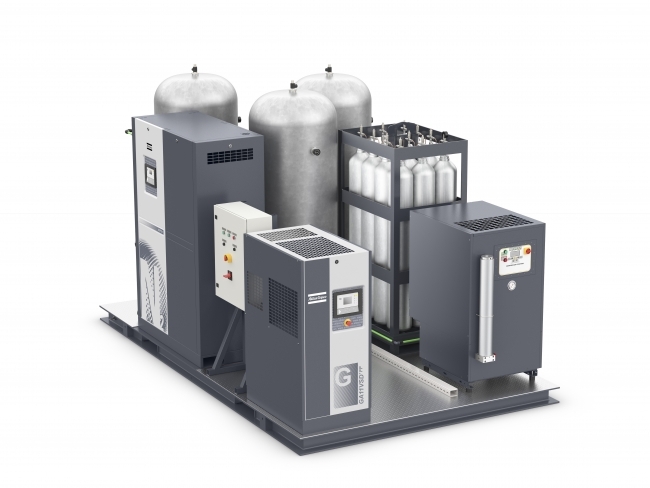 A nitrogen generator’s air factor defines the compressed air volume required to obtain a specific nitrogen flow. Atlas Copco’s latest NGP+ units’ key feature is their industry-low air factor, which reduces running costs by 50% compared to other nitrogen generators. Atlas Copco continually gathers and analyses data from applications around the world to progress industrial gas processes. As a result, it is positioned to help UK manufacturers improve their productivity, processes, energy efficiency, and their bottom line.